(adiyEn) wore in my head, as a decoration, the two beautiful divine lotus feet of amudhanAr of mUngil kudi; (so) as my accumulated karmas are decimated, why would adiyEn be answerable to the yaman, etc., of the south side? munnai vinai agala – All my ever-accumulated good and bad karmAs due to good and bad deeds, are removed – how? due to amudhanAr’s thiruvadi (lotus feet) was set in my head. mUngil kudi amudhan – periyAzhwAr said ‘vEyar thangaL kulam’, and amudhanAr is said to be belonging to ‘mUngil kudi’. ennudaiya chennikku aNiyAgach chErththinEn – For his (amudhanAr’s) head the decoration is rAmAnujar’s lotus feet (105th pAsuram); for me amudhanAr’s lotus feet. 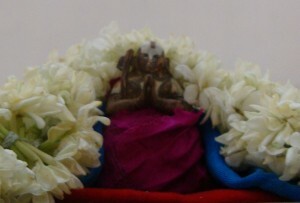 chennikku aNiyAgach chErththinEn – placed in my head as a decoration. 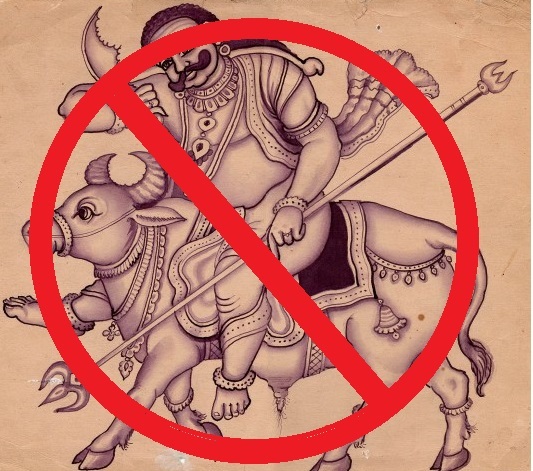 Like said by “chemmA pAdha paRputh thalai chErththu” [thiruvAimozhi 2-6-1]. There it is a prayer/request; here it is an accomplishment/success. then pulaththArkku – yaman and his servants at yamapuram. ennuk(u) kadavu udaiyEn – why would I be responsible for experiencing the fruits of good and bad karmas? Since my karmas have gone, there is no experience of its fruits. So there is no interaction between me and those who give me to experience the fruits of karmas. Like there is no connection between nectar and poison, there is no connection between those who are related to thiruvarangaththu amudhanAr’s divine feet, and those in the south side (yaman and his servants). yAn – adiyen, who decorated my head with amudhanAr’s divine lotus feet. Dear mind! Please agree to recite the rAmAnusa nURRanthAdhi that is made of kaliththuRai anthAdhi (grammar for a form of thamizh poetry), created by thiruvarangaththu amudhanAr who is having ever growing bhakthi (devotion) towards rAmAnujar who has got the greatness of getting victory to those who reached him and followed based on his advice that the enjoyment given by the senses are useless, and kept their minds away from it. nayam tharu(m) pEr inbam ellAm – The bliss that comes from enjoying the pleasures of senses. ‘nayam’ – vishayam – object of senses. Like said in ‘nANAmai naLLEn nayam” [mudhal thiruvanthAdhi 63], here also it is talking about the pleasure of senses like sound, taste, etc. (shabhdhAdhi). Even though they provide low level pleasure, it says ‘pEr inbam’ (higher level bliss) as per the opinion of the illiterate. sayam thaRu keerthi irAmAnusan – emperumAnAr would help them achieve victory (out of) the samsAram. It is AzhwAn and amudhanAr who left the lowly pleasures and reached emperumAnAr. And amudhanAr said “akkAdhal aLaRRil azhundhum en Aviyai vandhu eduththAn‘  to imply emperumAnAr saved him from lowly pleasures. Also, “kAmAdhi dhOsha haram Athma padhAshrithAnAm rAmAnujam yathipathim” [yathirAja vimsathi 1]. This is the greatness of emperumAnAr, getting us victory. Like said in “sayap pugazhAr” [thiruvAmozhi 3-1-11]. irAmAnusa muni thAL iNai mEl … – It is asking the mind to recite the prabandham that was created as a vAchika kainkaryam (service through words/speech) towards rAmAnujar’s two divine feet. That is clear from how it is the main topic of the prabandham as set in the beginning, middle, and end of the prabandham, so to emphasise this aspect – ‘irAmanusan charaNAravindham’ , ‘ramAnusan than iNai adi’ , and ‘rAmAnusan adip pU mannavE’  – all mentioning emperumAnAr’s divine feet. uyarndha guNam – Unlike others, the character of being involved in charama parvam (last level/stage) of being subservient to AchAryan. When there is difficulty in this world in finding people devoted to emperumAn, it is very rare to find those who are immersed in AchAryan’s well-being and sing praises on him, so (author of thaniyan is) praying his mind to agree to recite rAmAnusa nURRanthAdhi. Could say – since there is nobody to be found to listen to this request, he is requesting his mind itself. Or, it is also recited as “nayam thaRu pEr inbam ellAm pazhudu inRi naNNi nam pAl sayam thaRu kIrthi irAmAnusa muni” – that is, as we considered all the enjoyments to be emperumAnAr only and so reaching him for his support, he would give victory for us from the samsAram. Or, it could be attributed to emperumAnAr that he ignored the lowly pleasures as – ‘nayam tharu pEr inbam ellAm pazhudhu enRu’. (naNNi) – he surrendered to nArAyAnan. (nanpAl) – having good characteristics – that surrending to emperumAn is considered by emperumAnAr as the goal. (sayam thaRu kIrthi irAmAnusan) – not only for himself, even those who surrendered to emperumAnAr are able to win the samsAram by his help. Oh rAmAnuja who won over the other six philosophies! As the dear disciple thiruvarangaththu amudhanAr performs vAchika kainkaryam to your divine feet by keeping in his mind the (108) pAsurams created with beautiful words, adiyEn plead that such name of yours (from these 108 pAsurams), be also set in my tongue at all times – day and night. nal anbar Eththum – amudhanAr who is ananyaprayOjana bhakthi yukthar (~devoted to you without expecting any other benefits); anbar – one having bhakthi towards emperumAn; nal anbar – one having bhakthi towards AchAryan. Or, including amudhanAr all the devotees of rAmAnujar – then ‘sollin thogai’ would mean collection/group of words having rAmAnujar’s divine name. un nAmam ellAm – all the divine names that he/they recite due to the ecstasy based on bhakthi; since there is only one name that is rAmAnujar, the plural form ‘names’ here is to be taken as all the pAsurams of this prabandham having the name of rAmAnujar. allum pagalum amarumpadi nalgu – Like said in “naL iruL aLavum pagalum nAn azhaippan” [periya thirumozhi 1-1-5] (will say day and night the name of nArAyaNa) , please help to have your name set in me whether day or night. aRu samayam vellum parama – oh the great, who won over all other six philosophies; this is same as what amudhanAr says in a pAsuram here ‘kURum samayangaL ARum kulaiya’ . idhu en viNNappamE – this is my plea. With us having the essence of sAvithri manthra which itself can be said as the essence of all the vEdhas, which could be suitably named as prapanna gAyathri, with all the one hundred and eight pAsurams having the divine name ‘rAmAnujan’, that is provided to us which is a great help of amudhanAr, there is no deficiency for us in this and the other world. ini en kuRai namakku – there is no loss – in this world we say the divine name of rAmAnujan – ‘solappugil vAi amudham parakkum – rAmAnusan enRu solluminE’ (43) said amudhanAr – in amudhnAr’s mouth, the amudham (nectar) would secrete upon saying his name. (or the nectar that are the granthams that came from rAmAnujar); Since his name helps in getting mOksham, there is happiness not only in this world but in that world also. So, what worry is there for us hereafter? AraNya kANdam – lakshmaNa mentions to rAmA that he wonders how bharathan tolerates the cold sarayu river when taking bath in the wee hours; this makes rAmA forget himself and he talks of even going back to ayOdhya to care of bhArathA. He asks lakshmaNA to talk more about “bharathan the chief of ikshvAku”. So rAmA’s opinion is that it is like a nectar (amudham) to talk about rAmA’s brother (anujan), bharathan. He (emperumAnAr) is also rAma anujan! Talking about him also is sweet and so helps us in this world. emperumAnAr thiru nAmaththAl – The author of this thaniyan, sOmAsiyANdAn loves to use the name ‘emperumAnAr’, hence he says that name in this thaniyan instead of saying rAmAnusar. “sOmAsiyANdAn ’emperumAnAr’ enRAl thirunAmam niRam peRumAp pOlEyum’ [eedu for thiruvAimozhi 6.5.7] (the name ’emperumAnAr’ gets its full meaning when it is said by sOmAsiyANdAn). There is an issue with emperumAn’s divine name – it helps to tie us in the samsAram as well; but emperumAnAr’s divine name does not have that problem since it helps us only in getting mOksham. muni thandha – sarvEswaran is referred to as ‘muni’ – root from manana shIla: – as emperumAn thinks deeply about helping the AthmAs. After creating brahmA, He first gave him gAyathri manthra with praNavam, and then the vEdhas. That manthra is recited 108 times. Its inner meaning is praNavam – it consists of a (அ) – for emperumAn, u (உ) for pirAtti (one who connects/recommends), and ma (ம) – devotees. u is also udaiyavar who connects/recommends. emperumAn likes his adiyAr’s (devotee) name more than His name – this prabandham recites rAmAnujar’s name 108 times in the 108 pAsurams. Now, by thathsavithurvarENyam it talks about nArAyANan in the solar world; He gave sAvithri mathra and removed the darkness of this world through the sun; rAmAnujar is rAmAnuja divAkarar (sun that is rAmAnujar) who removes the darkness from our minds. The essense of thirumanthram is sEshathvam (subservience) to His adiyArs. ‘nin thiruvettezhuththum kaRRu nAn uRRadhum un adiyArkku adimai’ [periya thirumozhi 8-10-3] (~ learning the thirumanthram, I became subservient to your devotees). kali thandha senjchol . . . – kali: smartness/power – here the prabandham gave us the divine names. senjchol – sweet words. spoken words that are congruent with the thoughts and actions. This is how eedu explains senjchol in thiruvAimozhi 10.6.11 as well. So, it can be concluded that all the three senses are in union when we recite the prabandham rAmAnusa nURRanthAdhi. kalith thuRai anthAdhi – in the thamizh poetry form of ‘kalith thuRai’. senjchol kalith thuRai anthAdhi – anthAdhi makes it is easier to know the next pAsuram. (last part of previous pAsuram becomes first part of current pAsuram and so on). pAdith thandhAn – amudhanAr gave this for the future generations (us) to enjoy and immerse in the glories of rAmAnujar. punidhan – amudhanAr who is pristine; the pristine way in which he gave us this prabandham; will make the opposite type of people to become pristine; amudhanAr praises the punidhan who praises Lord parasurAma . 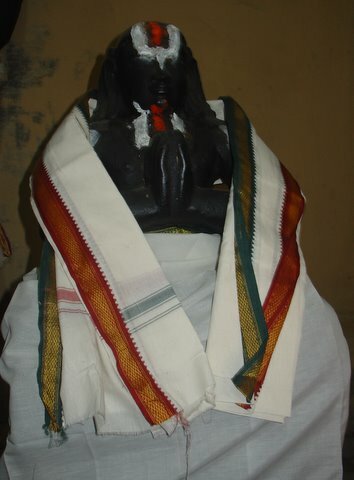 thiruvarangaththu amudhAgiya puNNiyanE – Virtuous thiruvarangaththu amudhanAr. ‘irAmAnusan mikka puNNiyanE’ – virtue that came from the great virtuous emperumAnAr. pAsuram words are to be arranged as – virtuous thiruvarangaththu amudhan gave us the kaliththuRai anthAdhi using the names of emperumAnAr, so what problems do we have from now on? This thaniyan is recited in thirunArAyaNapuram temple only. This entry was posted in iyaRpA, rAmAnusa nURRanthAdhi and tagged 4000, anthadhi, azhvar, azhwar, dhivya, divya, english, introduction, iramanusa, jeeyar, jIyar, meanings, naalayira, naalayiram, nurrandhadhi, nurranthadhi, nutrandadi, nutrandhadhi, nutranthadhi, prabandham, ramanuja, ramanujar, ramanusa, thiruvarangathu amudhanar, vyakyanam on July 14, 2015 by raghuram.